Venezuela's chief prosecutor Luisa Ortega Diaz gestures during a news conference in Caracas, July 31, 2017. The Venezuelan state prosecutor's office said late on Wednesday it has opened an investigation into accusations that the country's elections council manipulated turnout figures in Sunday's controversial election for a legislative superbody. Voting technology firm Smartmatic, which provides the South American nation's voting machines, said the turnout figure of 8.1 million had been inflated by at least 1 million votes. It did not describe its methodology in reaching that conclusion. 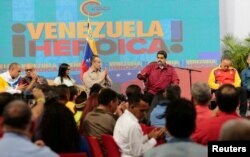 President Nicolas Maduro and the elections council denied the accusation. The vote count was crucial for the ruling Socialist Party to legitimize the vote for the constituent assembly, which was boycotted by the opposition and broadly condemned by countries around the world as an assault on democratic freedoms. "We are in the face of a grave and unprecedented action that could constitute a crime," Chief Prosecutor Luisa Ortega said in a statement by the prosecutor's office, which quoted her interview with CNN. She said that the accusations "constituted another element in the fraudulent, illegal and unconstitutional process," according to the statement, which did not say whether the investigation would be based only on Smartmatic's accusations. Socialist Party officials have for months questioned Ortega's actions and have begun judicial proceedings to remove her from office on the grounds that she has overstepped her authority. Ortega had described Sunday's vote as illegal. Maduro on Sunday said one of the top priorities of the constituent assembly, which has no formal restrictions on its power, would be a "restructuring" of the chief prosecutor's office. Socialist Party officials have suggested that the new assembly will remove her from office. Venezuela's President Nicolas Maduro, 2nd right, speaks during a meeting with members of the Constituent Assembly in Caracas, Aug. 2, 2017. Opposition leaders are calling for a march to the center of Caracas on Friday to protest the creation of the 545-member constituent assembly. The new body is empowered to write a new constitution and may dissolve state institutions, including the opposition-led congress. Maduro says it will bring peace to the convulsed OPEC nation after four months of violent opposition street protests that have left more than 120 people dead. His critics accuse him of running roughshod over the country's democratic institutions and of overseeing an economic collapse that has left millions struggling to eat and driven inflation into the triple digits. 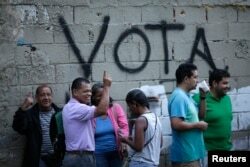 People wait in line next to the word "Vote" spray painted on a wall before voting during the Constituent Assembly election in Caracas, Venezuela, July 30, 2017. The Information Ministry, when asked for comment on the prosecution office announcement, referred Reuters to statements on Wednesday by National Elections Council chief Tibisay Lucena in response to Smartmatic, which came prior to the prosecutor's announcement. A National Elections Council official contacted by Reuters said there was nobody available to speak about the issue. Smartmatic did not immediately respond to an email seeking comment on the announcement. Only 3.7 million people had voted by 5:30 p.m. in the vote for the assembly, according to internal elections council data reviewed by Reuters. The elections council extended voting to 7 p.m., but some centers are thought to have stayed open longer.